"Dear Carol: I Committed the Sin of Overediting"
I’m sure you won’t get this before I gather my strength tomorrow and face the difficult task of answering one of my authors’ emails. But because I’m sure you’ve plenty of advice to give, better late than never. I received an email from an author over the weekend. He was very unhappy with the job I did editing his book manuscript and writes that I did “too thorough” a job, changing sentences that did not need to be changed, and in the process, introduced some typographical errors and some content errors. I will not say that this is untrue. I know I spent a lot of time on his edit, and I’m sure I did, indeed, commit the sin of overediting. My question is how do you come back from that? I know I need to submit an apology, but I’m not sure what else to say other than “I’m sorry you’re unhappy and for the inconvenience.” I’ve only been a copyeditor for a few months and I’m still trying to get the hang of this gig. My heart goes out to you! I’m sure you know that most of us have had an experience like yours at one time or another. I agree that you should apologize and express your regret for being overeager. Ask the writer if he would trust you to make another pass in order to put things right. If you do another pass, ask the author to explain the kinds of things he didn’t like. If you aren’t confident that you can fix the manuscript, it might be better to say so. In that case, offer to adjust the fee; perhaps ask the writer to pay you what he feels is fair. If the writer agrees that you did more good work than bad, he should pay you something. But whatever you lose in time and money will just have to be chalked up to your education! If your second pass turns out well, let that comfort you. And in any case, be very careful about the kind of assignment you accept next. It could be that this particular one was too tricky for a beginner. Finally, you seem to be self-aware, but know that there are writers who exaggerate and even err in their assessments. You might have done better than you think. Good luck! I hope you’ll let me know how it goes. Dear Author: Your Dangler Is Showing . . .
Having looked over your editing, the amount of it strikes me as excessive. Being what I consider a fairly accomplished writer, your intervention at that level seems unwarranted. Frankly, looking at all the redlining, your competence comes into question. Even acknowledging my slight preference for starting sentences with participial phrases, the question remains of why this should be a problem. Having won awards for my previous books, you are the first reader to find it lacking. In making so many changes to my prose, I wonder whether you actually understood the subtlety of my constructions! Having written and published more books than you have probably edited, my expertise should have been obvious. In responding to your editing, it will become apparent that I have restored much of my original. Studying it closely, I trust you will acknowledge your insensitivity. I fell the other day. I was late and rushing and tripped on some broken sidewalk and went down sprawling and skidding. I still can’t stop thinking about broken bones and lost teeth. This time, there was only a bloody knee and punctured palm. I picked myself up and hailed a cab (which I should have done to begin with), and a couple of blocks later realized I was without my eyeglasses, which must have flown off when I fell. Imagine that: I hailed a cab without my glasses! I don’t think I could normally do that. Was it that in my shock I momentarily acquired some kind of superpower vision? The cab wasn’t even an eye-catching yellow—it was just a dusty little beige. And I rode two whole blocks before I missed my glasses—but then, I suppose even the nearsighted can check for body parts. In the cab my panic over possible injury gave way to panic over losing expensive prescription glasses; we went back to the scene and the cabbie waited while I found mine. Miraculously, they weren’t even scratched. Putting them on, seeing everything clearly, I felt halfway restored. Ironic, considering that if I’d been watching where I was walking in the first place, I wouldn’t have fallen. For writers and editors, good vision is a handy tool. If you don’t often think about yours, take a minute now. If you’re young and well sighted, or older with stable vision, you might believe you don’t need eye exams. But without them, you have no way to know whether you are developing glaucoma. This condition is the second leading cause of blindness in the United States (cataracts are the first), and here’s the kicker: often by the time you have symptoms, it has progressed to a dangerous extent, and there’s no cure. Caught early, however, it can often be slowed by means of treatment as simple as eye drops. Not everyone has insurance to cover regular vision testing, but if you are over forty, consider making it a priority. Just one visit can tell you whether you have signs of glaucoma, and if you don’t, you can feel better about coasting a while between checkups. The August Q&A is up . . .
Q. “The telltale sign of a right-winger: they can’t write in English to save their lives.” Is “they/their” used incorrectly? Q. Based on CMOS 10.4, Los Angeles should appear as LA, but this can create confusion between the city and the state of Louisiana. How then do you treat Los Angeles when you need to abbreviate it? Q. If a person has two last names, but they are not hyphenated, like Harriet Beecher Stowe, how do you alphabetize them—by Beecher or Stowe? More questions (and answers) at the Chicago Manual of Style Online. It's free! I have been enjoying your blog on editing for quite some time. In particular, I appreciated your tips for newbie copy editors. I have been working freelance as a copy editor for a couple years with scientific and technical documents. I have recently expanded to copy editing and proofreading novels, which is a bit of a change. In general, would you agree that a copy editor should avoid making changes to the text unless a documentable style change and/or grammatical error has occured? What are your thoughts on using queries (in the comments) to attract the author’s attention to my suggestions? Your first question is the fundamental question of copyediting: when to step in and when to resist. Having this kind of judgment is what separates a beginner from an experienced editor. —There are often excellent reasons to do otherwise. —Rigidity rarely serves the reader or the writer. I’m sure you can already think of examples in your own editing where you felt that it would be counterproductive or even ruinous to follow the style guide, or where the writer wanted to break a rule for a reason, and you got the point and agreed that it would be best. 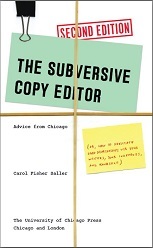 This is the foundation of “subversive” copyediting: we aren’t robots who mechanically apply a style guide, and we aren’t there to slap the wrist of the writer for breaking rules. Instead, we use the style manual as a guide for working with a writer and the text; we use a style sheet to keep track of departures from style; and over time we learn from mistakes and successes what works best. We use common sense and judgment. —If you find yourself writing the same comment more than a couple of times, consider writing a blanket query in your cover letter and flagging each instance in a more economical way. —Resist writing justifications for editing that is self-explanatory. —Remember that reading a comment takes the writer out of the text and costs time. Make it worth the trip.